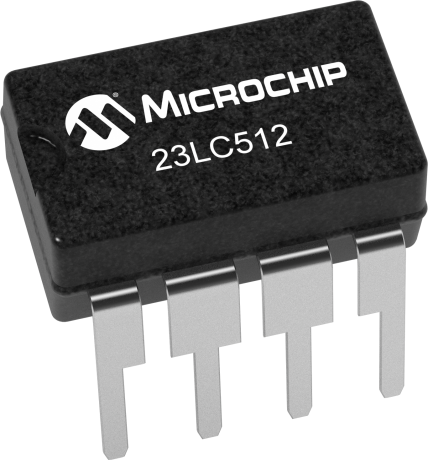 The Microchip Technology Inc. 23A512/23LC512 are 512 Kbit Serial SRAM devices. The memory is accessed via a simple Serial Peripheral Interface (SPI) compatible serial bus. The bus signals required are a clock input (SCK) plus separate data in (SI) and data out (SO) lines. Access to the device is controlled through a Chip Select (CS) input. Additionally, SDI (Serial Dual Interface) and SQI (Serial Quad Interface) is supported if your application needs faster data rates. This device also supports unlimited reads and writes to the memory array. The 23A512/23LC512 is available in standard packages including 8-lead SOIC, PDIP and 8-lead TSSOP.